Lanzhou is now a comprehensive transportation hub containing a well-developed aviation system, railways and highways, where four main railway lines and six state highways intersect. Lanzhou Zhongchuan Airport, located some 70 km north of Lanzhou city proper, is the top-ranking airport in northwestern China. Flights connecting it with 30 more domestic cities depart from and arrive at the airport on a daily basis. Lanzhou Railway Station is a major railway hub in western China. Every day, over 100 passenger trains originate from or pass through the station. 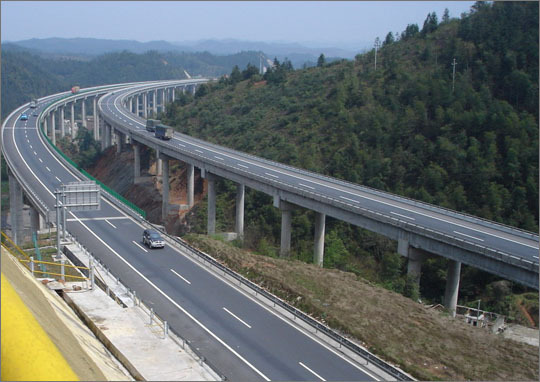 It is a vital focal point connecting the western Chinese provinces with the east. Lanzhou Railway Station's location is on Huochezhan Dong Lu, in Chengguan district. It has the following railway connections: Longhai Railway to the east (Xi'an, Zhengzhou, Lianyungang), with a connection to the main railway of eastern China, supporting direct trains to Beijing, Shanghai, etc. Lanxin Railway to the west and northwest (with direct trains to western Gansu and Urumqi, as well as further connections to other points in Xinjiang and to Kazakhstan). Lanqing Railway to the west and southwest, with direct services to Xining and Lhasa. A line to the north and northeast of the country, with direct services to Yinchuan and Baotou. The construction of new high-speed passenger-only railway lines is carried out both toward the east (the Xulan Passenger Dedicated Line) and the west (the Lanxin High-Speed Railway). These services will employ the newly upgraded Lanzhou West Railway Station. In August 2012, Lanzhou became the second city in northwestern China to begin building subway lines. The planned urban railway network, Lanzhou Metro, will consist of six subway lines running along 207 km, according to the general blueprint. Three of the subway lines, coded Line 1, Line 2 and Line 3, will extend for 90 km across the city proper; while the three outer lines, coded Line 4, Line 5 and Line 6, will run along 117 km, connecting the city center with Lanzhou Zhongchuan Airport, Yuzhong county and Gaolan county, respectively.